If you’re from Toledo, and you ride a motorcycle, you have probably heard of Cycleman on Lagrange Street. I’m not sure how long he has been there. I’ve been in Toledo about twenty years, and he’s been there since before I came to town. I’ve never seen so many motorcycle parts in one place. If you ride a street bike, he’s probably got that last thing you need to finish your restoration. I was on Lagrange Street looking at storefronts that are for rent. We were just a block from his shop, I’ve never been in there, so I decided to check it out. My son and I were greeted by nice older mom and pop kind of team. Very friendly people. I just sort of blurted it out. He wasn’t threatened or put out in the slightest by me. He was cool about albeit dismissive. That’s fine. I have great respect for Cycleman and his shop. He knows motorcycles and has parts hanging from parts. There are not enough days on earth for me to think that I could ever hope to learn half of what he has forgot about motorcycles. And he’s not interested in selling riding gear. As a matter of fact, he even turned me onto a shop to check into. 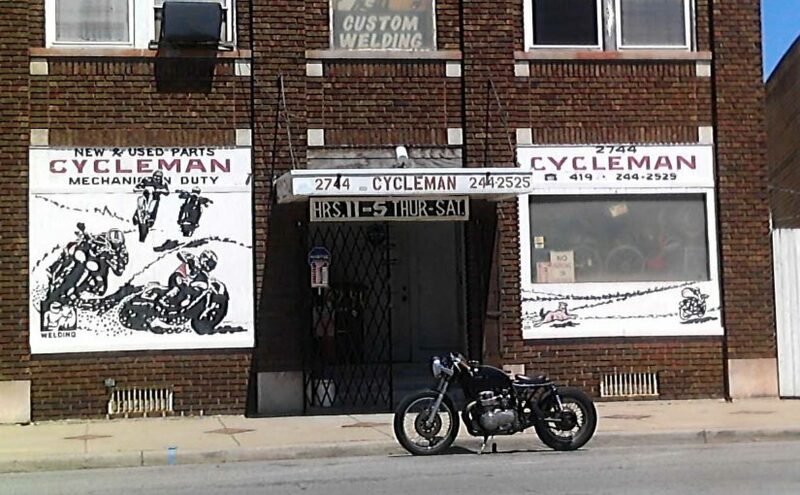 Any time someone calls or stops in my shop and is looking for vintage motorcycle parts, I’m going to send them to see the Cycleman. If you talk to them, let them know you found them here.